It's wonderful to have this kind of technology. God, does some wonderous things. One being the gift he gives to the doctors and the people of his/her staff. God, has given Lori the beggest gift of all. The ability to get through it. Hang in ther Aaron and Lori, you have been touched by an angel and her name is Naveah. Love to you always. Great Aunt Vickie! Please know you don't have to walk this path alone. . .we will do whatever we can to help support you. praying for you! this is Joy--mommateapot from cafemom. It was good that you got to see the PICU. That helped me alot before my daughter had her heart surgery. You and the family will be in our prayers, especially Nevaeh. God has something special for her. 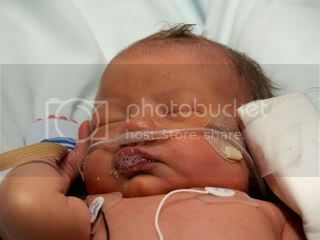 My daughter had the same surgery May 14, 2007 when she was just 6 days old! She is doing great now and has not had any heart complications, though she was in the hospital for 11 weeks out of her first 4 months with what we later found out to be bowel malrotation that was surgically corrected and she has been fine ever since!! We are now working on catching up on her milestones since she is behind due to all the hospital time!! We also have 2 boys that were at home during the hospital stuff and it was hard trying to stay with Emmy and be home for the boys at the same time! You just want to clone yourself so you can be in both places at the same time!!! We will be praying for you and your family! I can't wait to hear how great she is doing and see lots of pictures! I have lots from the hospital, if you want to see some so you can know what to expect, LMK, though I don't think anything can quite compare to seeing your own baby in that situation! For me, the hardest part was carrying her down to the OR holding area and handing her to the surgeon... I still cry when I think of having to do that!!!! Glad that you were able to tour the unit where she'll be after surgery. Yes, it is very hard, but you are one step ahead & will kind of know what to expect. 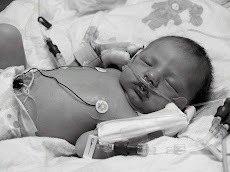 We weren't afforded that luxury, as we found out about our Nevaeh's defect after her birth. Know that you have so many people praying for you & supporting you, whether in person or in "blogger-land." Feel free to email me to chat any time (gabnvaeh@yahoo.com). I, too, am a member of IHH, but hardly ever post. I do read the messages, though, and wanted you to know that I'll be praying for you as you travel this scary road! My husband and I also knew before Emma's birth that she would have heart defects....and a good possibility of a genetic condition. We worried ourselves sick, scouring the internet, wondering what it could be. Down Syndrome was mentioned and so was Di George. It turned out to be a rare chromosome 6 deletion...something the geneticist had never seen. Since then, we've found an online support group and met many other families with a similar deletion. I've only found 2 with the same heart defect as Emma. She's the light of our lives....happy and sweet, in spite of her challenges. 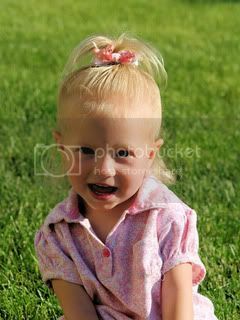 I know that Nevaeh will be the same for your family as well. I remember the worries and the fears...and the tears. Stay strong, and know that you have so many already praying for you and your family. Heart Hugs from Syracuse, UT! We are excited to meet your sweet angel. My niece continues to hold her own, but for the most part has been a sick little girl. You just never know. I just pray that Naveah (sorry if that is spelled wrong) is strong and I know that she is guarded and attended to by some of the best angels around! Prayers to your family!